World Women Chess Championship day 8 LIVE! Welcome to the live coverage of the World Women Chess Championship on Chessdom.com! After the convincing victories of the top seeded Hou Yifan, Antoaneta Stefanova, and Pia Cramling, they need only a draw to go on in the next round. Anna Ushenina is also close to qualifying after defeating Svetlana Mateeva with black. All the other games finished draw and an exciting day awaits us. Askhat Mechiev has a very interesting interview with Svetlana Mateeva, who defeated Xu Yuhua. - Sveta, will you tell us a few words about the round in general. You said that you had won the previous one on the account of your opponent’s mistakes. What can you say about this one? - My position in this round was also really serious and difficult. Pretty soon I lost the right to castle and I had to defend myself. It is always more difficult to defend that’s why I committed a serious mistake closer to the time control. As a result my position was almost hopeless. Somewhere on the 36-38th moves I thought the game was over and resigned myself to the tiebreak. Then I overcame the impulse to give up immediately and decided to fight. At that very moment my opponent lost her confidence. Not making correct moves she was constantly putting herself obstacles to win. In the end she committed a serious mistake and lost a lot of time. - You played with her two years ago in the semi-final. Then Xu Yuhua won. What changes did you both undergo? - To begin with, she became a mother of a baby boy. This is the main thing for any woman. Now she spends more time with her family and her child. That’s why I think she has lost her confidence and permanent readiness for play tension. Judging by recent tournaments I can see that her level of playing has a bit lowered. As for me, the victory has inspired me but I wouldn’t speak of some powerful surge of energy because one can’t expect great sport success at my age. But truly speaking I got rid of some psychological problems and I hope it will help me to play the next game successfully. - Will it be easier to play in the tournament without the incumbent Champion? - I don’t think anybody pays much attention to such things. Those who are left are also very strong chess players. There are no weak players left by the third round. - Have you played with Ushenina before? - Yes, we had several draws. This time we shall “sort out our relationship” seriously. All the photos from yesterday’s round 3 game 1 are available at the Chessdom photo gallery. The trend from the previous days continues – Stefanova, Yifan Hou, and Pia Cramling have not lost a single game. What’s more, Yifan Hou has a perfect score until now, not letting any chance to her opponents. Many wonder how she reached this high performance level in the past months. The key is surely in the multiple tournaments she is playing. 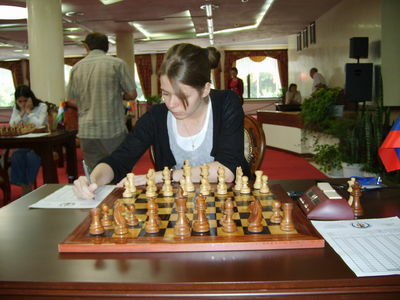 Especially valuable was the World Junior Chess Championship, where she played in the junior section. Many international TVs and newspapers reflect the events around the WWCC in their news. One of them is NDTV (New Delhi Television), who focuses on the performance of Harika and Koneru. Other sources from India covering the championship are Press Trust of India, Hindu, Sify, Indiatimes, etc. Russian media partners are abundant as well, including Interfax, Ugmedia, Radio Mayak, e3e5.com, Sportbox, Rosiiskaia Gazeta, etc. Games start in one hour, stay tuned for the latest photos and news from the playing hall. Monika Socko and Anna Gasik were interviewed before leaving Nalchik. Here is an excerpt of the interview. Monika: I was very upset when I lost and didn’t want to leave. Now that we visited the Blue Lake and Hot Springs I don’t feel like leaving at all. I would like to stay in this beautiful city and play chess a bit more. Anna: Beyond the lake and the springs we also saw the tiebreak. - Who do you think is the strongest player at this Championship? Monika: – I think the representatives from China and Koneru Humpy from India. - Who did you support? Monika: I’d say Cmilyte, Stefanova, and Kosintseva. The desire for victory is obvious, as most games opened aggressively and mainly with 1.e4. The result from the opening – 2 Ruy Lopez, 3 Sicilian, 1 Modern, 1 Dutch, and Antoaneta Stefanova applying her favorite Trompowsky. Nadezhda Kosintseva and Shen Yang are storming through the opening and are at move 17. Kosintseva is currently with more time than at the start of the game. Right in the opposite situation are Mateeva and Ushenina who have played only 7 moves. The photos from the beginning of the round are ready and in the next minutes we will present you a few of them. As the games are developing we remind you that the live coverage from Bilbao starts at 17:00 CET. Check out the latest results, videos, and commented games from the Final Masters. As usual Lilit Mkrtchian was the first to arrive to the playing hall. Her opponent Harika Dronavalli was the last. However, they are both moving with equal pace through the game. Natasa Bojkovic left yesterday from Nalchik with many presents for her birthday. She is already playing her next tournament – the Serbian league. Very untypical situation in the game Sedina – Hou Yifan. Sedina has always been in time trouble during this tournament. However, now she has 1 hour and 11 minutes, for only 37 minutes of Yifan Hou. Can this game be the surprise of the day? Kosintseva sisters deviated in the same manner (6. d3 and 8. a4) from main Ruy Lopez lines. They probably have prepared for the game together. Harika and Mkrtchian have opposite color bishops on the board. However, Mkrtchian is 2 healthy pawns up, and adding the rooks into the picture Harika might have chances for saving the game. As Harika’s king got blocked, there was no way to stop the white pawns. Mkrtchian qualifies for the next round! Harika played very well and she will surely be an important factor in women chess in the next years. There was a broadcast error in the game Ruan Lufei – Cramling. Now the moves are back to normal, you can refresh the official website. Koneru has launched a dangerous attack against the king of Hoang Thanh Trang. Lilit Mkrtchian is thrilled after her win, she immediately went to give an interview for the local TV. Opposite color bishops draw in Ruan Lufei – Pia Cramling. Cramling has qualified to the next round! Good performance by Ruan Lufei as well. No way to stop Koneru’s attack and India will have a representative in the next round! Good games by the Hungarian player as well. 3P + Queen for Hou Yifan vs 5P + Queen for Elena Sedina. Goran Urosevic just spoke to Lilit Mkrtchian. She decided to surprise Harika and prepared a variation that she never played before. She believes she succeeded in her intentions as Harika made a couple of inaccuracies. Later on, she had two extra pawns and was searching for a way to secure the win with opposite-colored Bishops on the board. She is regretting that she missed a strong exchange sacrifice, she saw that motif immediately after playing her move. Harika was playing fast while Lilit was in time-trouble and probably missed a couple of more resisting moves. The “b” pawn is unstoppable and Kosteniuk qualifies to the next round by winning the Russian derby. Today Chessdom.com will have 2 commented games from Bilbao – the battle of the young talents and the battle of the world champions. Go to the main page to find the links to the games. Stefanova wins against Gaponenko and with full 2-0 progresses to the next round. Elena Sedina brings the surprise of the day! The much lower rated Italian player scores a full point and goes to tiebreaks with Yifan Hou. Very heavy battling in Ushenina – Mateeva and N. Kosintseva – Shen Yang. Anna Ushenina wins convincingly the match 2-0 and goes on to the next round. At the same time Shen Yang and Naddezhda Kosintseva draw again and will see each other in tomorrow’s tiebreaks. Tomorrow’s tiebreak: Yifan Hou – Elena Sedina and Shen Yang – Nadezhda Kosintseva. Stay tuned for minute by minute updates.